What is your all-time favorite hymn or spiritual/religious piece of music? That may be hard to narrow down, but if you are a regular reader of this column, I know that you likely go to church and participate in regular worship services. If you do that, you also likely enjoy the songs and hymns most churches count as a very important part of their worship of God. It is the music portion of a service that most often moves me emotionally, even to tears, and I’m not alone in that. You probably have a number of favorites, depending on the mood and circumstances. Of the many privileges I have had working as a writer for the Mennonite churches these past 42 years, getting to help—in however small of capacity—on a new worship and song collection for the church is stirring and rewarding. We are currently about half way through that process at the agency we call MennoMedia and while I plan to retire from my job before it is finished and published, I have learned a little of the tremendous planning, thought, sleepless nights and even tears (usually the emotional, joyful kind) go into producing and publishing a hymnal. Hymnal: A Worship Books is looking dog-eared and worn in many pews. It is a once in a lifetime opportunity for me, even though there are musicians and leaders in the church who have worked on two or more such productions. Denominational hymnals are not usually created more than once a generation and may even span 30-50 years between new hymnals. Let me also hasten to say there are many of us assisting with the process who are not musicians and barely know a treble clef from a bass. While I sing heartily with a congregation, you wouldn’t want me to sing a solo anywhere other than the shower. But I have been privileged to work behind the scenes writing or editing things like news releases, and helping on fundraising and marketing tasks. As part of the editorial team at MennoMedia and Herald Press, this has also included sneak peaks at various cover designs and colors, and voicing opinions on options for title and cover. It is such a collaborative process, that other than the project director, in this case a splendid musician and teacher, Bradley Kauffman, no one person can be named as author or creator or organizer. From the staff end, Amy Gingerich as executive director has been supervisor and cheerleader to the process. What a group effort—especially for the actual committee, mostly volunteers, numbering around a dozen. From upper left, the marketing and editorial team weighing on the new cover: Valerie Weaver-Zercher, Melodie Davis, Amy Gingerich, Rueben Graham, Joe Questel, LeAnn Hamby, Alyssa Bennett Smith, Bradley Kauffman (project director) and Merrill Miller (designer). Raising the funds to develop a long-term project like this has been spurred by a huge and generous $100,000 matching grant from two Mennonite-related agencies, Everence and Mennonite Central Committee. They made the grant because they see church music as so important to the future of the church: bringing new generations to love singing and worshipping God through music. This collection will be published not only as a traditional book for church pews, but a projected edition and a digital app. It will also have artwork in it – expecting 12 pieces to lead and inspire congregations in worship. I’m told that artists are super pleased about this aspect. In addition, the music will represent a wide variety of cultures, countries, and Christian theology: truly a book which voices can enjoy, together worshipping the God who made us all. 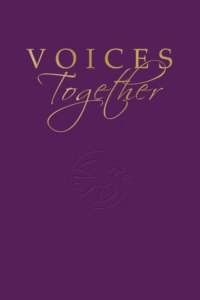 For more about the hymnal project visit voicestogetherhymnal.org. Send comments to me at anotherwaymedia@yahoo.com or Another Way Media, P.O. Box 363, Singers Glen, VA 22834. We honor the work of the committee! Bradley attends our church, CMF, and we were treated to members of the committee worshipping with us this summer. It’s a monumental task and achievement. I have quite a list of favorite hymns. Anytime I sing one I can still hear my dad singing bass beside me. Now, after all of my Miller Cousins made a trip to Valley Bethel Church of the Brethern In Bolar, my favorite hymn is “Blest Be the Tie That Binds” . Our Grandfather was a minister there sometime after its founding in 1905. There was not a dry eye when we sang that song on that special day! I can imagine the no-dry-eye experience, how rich and bonding. I often hear my father too–such as on a song like Blessed Assurance. Daddy loved to sing but was more of a joyful singer–and I can hear his bass sliding up or down to hit the right notes, if you know what I mean. But to me the memory and sound in my heart and mind is touching and beautiful. Thanks for sharring here, Kathy.